Congratulations to Ana Vargas from San Diego, CA on earning an ABC Medical Scholarship! Born in Taiwan and raised by a Mexican family, Ana is just another beautiful example of the diversity in American nation. She's currently enrolled in San Diego Mesa Community College, majoring in Kinesiology. 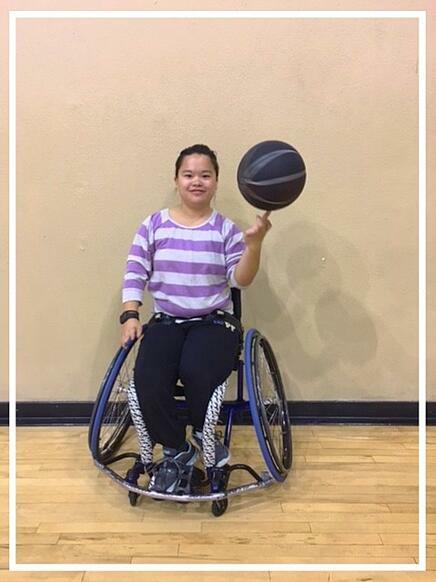 Even though Ana states she doesn't stay interested in hobbies for a long time because of her ADHD, we can tell she's going to stick with wheelchair basketball for a while, as she has already been playing for 10 years now! Sounds like a truly passionate athlete to us. Ana wants to use the ABC Medical scholarship to get her chair repaired, due to lots of "crashing to people!" "When you are at your limit, you need to adapt. to do the unlimited and as a person you have to believe. in yourself by going beyond your limit in everything and finally, compete. in all of the challenges ahead of you. The point is go beyond your limit and challenge yourself to infinite possibilities and nothing can stop you." Check Out Ana Vargas' Awesome Video on YouTube! Click Here.